Trying to think your way through a tricky roadway situation doesn’t work, especially in winter weather. Instead, you have to learn ahead of time how to react. Then, when the time comes, you react without thinking. You can arm yourself by being mentally prepared, knowing your vehicle, staying apprised of upcoming winter weather advisories and these simple tips. Keep in mind different road surfaces — snow, black ice or hard-packed sanded snow — will give you different stopping distances based on your speed. Motorwise.com advises you will need 10 times the usual stopping distance to stop your vehicle on snowy roadways. Slow down and increase the number of car lengths between you and the vehicle in ahead to ensure your safety while driving through icy or snowy conditions. Winter often brings the ugly sound of spinning tires working effortlessly on ice and snow packed roadways. This is the worst way to gain traction. Spinning your tires melts the snow and actually makes the surface even more slippery. You should back off of the accelerator and give it just enough gas to make the car move forward. If your vehicle is still struggling and won’t budge, put sand or cardboard under the tires. Do you have a vehicle with front-wheel drive, rear-wheel drive or all-wheel drive? Each of these drive types will handle differently. If you are fortunate enough to own a front-wheel-drive car, the weight of the engine is directly over the driving wheels, giving you better traction. This will provide you with a better chance to get where you want to go without spinning out — going into a 360-degree rotation — than with a rear-wheel-drive car. All-wheel drive and four-wheel drive are the best choice when it comes to driving in the snow. Almost every all-wheel-drive car will automatically put power to all four wheels when the tires begin to lose traction. Four-wheel drive vehicles are typically activated by a switch or lever on the dashboard. If you are unsure what drive type you own, check your owner’s manual. Knowing your car will be key when it comes to driving under wet and icy conditions. Have you ever had to slam on your brakes only to feel your car vibrating right beneath you. No worries. That is your anti-lock braking system doing its job! This feature will allow you to continue to steer even though you’re braking as quickly as possible. If your car has ABS, you no longer need to pump the brakes, as was recommended in the past. The ABS does this for you and does it faster than you could. This computerized system automatically detects when the wheels are losing traction and adjusts by braking the individual wheels to keep you going in the right direction. It is still important to maintain a safe distance behind the car in front of you so you don’t need to put your brakes to the test! 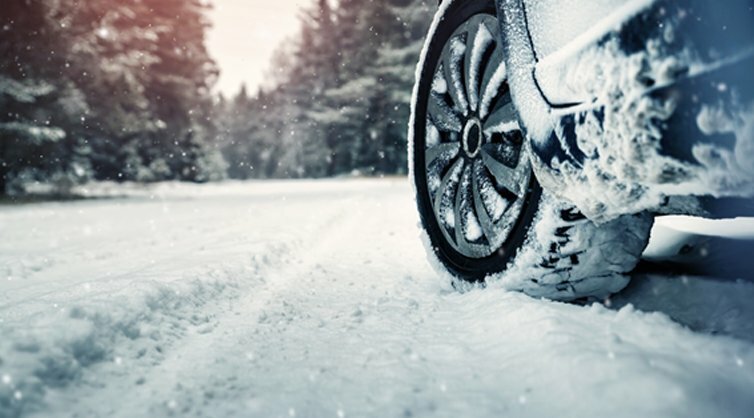 Your tires are crucial for proper traction and being able to stop in snow and ice. There are 3 main tire types: summer, all-season and winter. Edmunds.com’s testing found an enormous difference in stopping distances among these three types of tires — in some cases as much as two car lengths. If your tire tread is worn, be sure it does not fall below 2/32 inch, or not past the top of Lincoln’s head when you insert a penny upside down. New tires in the winter are a must have with those driving on worn or low tread. Be sure to stay safe out there this winter season and keep the turnpike emergency cell # in mind. Simply dial #677 on your cell phone! It is also a good idea to restock your emergency roadside kit to include extra clothing, blankets and non-perishable snacks that will come in handy while you await help to arrive. If you need quality collision repairs, call us at 419.841.2525 or stop by the shop Monday through Friday between 8 am to 5 pm, 7939 West Central Avenue, Toledo, OH 43617.